Us and Them (后来的我们) is a Chinese tragi-romance told through two narratives. In the present, ex-lovers Jianqing (Jing Boran) and Xiaoxiao (Zhou Dongyu) meet by chance while stranded on their way to Beijing over New Year’s. Stuck together for a night, their reminisces turn into flashbacks, bringing us to a second tale of romance in their younger days, as they tried to start lives in the city. Jianqing and Xiaoxiao first meet as they try to eke out a meager existence in Beijing. 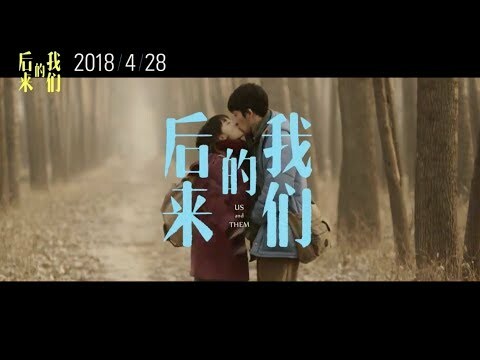 Fresh in the city from their homes in the countryside, the pair initially meet on the train ride home while Jianqing is still a college student. Later, the two become shop owners peddling pirated software and Japanese adult videos. They both see Beijing as a city of limitless opportunity. Jianqing has dreams of making video games, while Xiaoxiao wants to obtain a Beijing residency permit (a 户口, or hukou, granting access to local public services such as schools and hospitals, or even the right to purchase a house) — an aspiration shared by many migrant workers in urban China who originally hail from the countryside. This era of their lives occurs in the early 2000s, the same decade when many Western millennials came of age. In many ways, Jianqing and Xiaoxiao’s struggles to “make it” in the big city echo the struggles of young people across the world. Saddled with the expectations of their parents and society, young people today are put under tremendous pressure to attain success not only materially (via home ownership and a high-paying stable job) but also familially (a la parental questioning of “when will you get married?”). In many ways, the tight-knit family environment of China worsens this problem. Traditionally, once a year over Chinese New Year, Chinese millennials’ parents and relatives gather for 团年饭 (tuan nian fan, or a “New Year get-together dinner”). During these family reunions, it is common for relatives — however distant from your daily life — to question your relationship status, roadmap to marriage, and your plans to “settle down”. These questions annoy the latest generation in China so much that they have resorted to obtaining fake girlfriends and boyfriends to avoid scrutiny from their elders. The difficulty of reconciling familial pressures with reality have led many youths in China to give up entirely on fulfilling the expectations of their parents and relatives. This has given rise to sang culture in China: a self-ironic rejection of the definitions of success imposed by the elder generation, and an embrace of a more personal and modern definition of success. “youfang youche youqian”). These three qualities are often required for a man to find a girlfriend in China, and have often been satirized for representing the materialism that has come to dominate relationships in China (for example, in this spot for Didi — Chinese Uber). No tragi-romance would be complete without a breakup story. Therefore, it’s no spoiler that Jianqing and Xiaoxiao eventually split on sudden terms in their younger days. What then makes Us and Them different from other tragi-romances (such as My Old Classmate) is how the male protagonist decides to deal with the breakup Instead of wallowing in sorrow, Jianqing decides to build his own video game inspired in part by Xiaoxiao, which ultimately leads to his material success in the present day. Of course, building a tech startup isn’t as easy as a mere 15 minutes in a movie could capture, but it was admirable to see Us and Them depict Jianqing pulling himself up by his bootstraps and channelling his newfound loneliness and general misery into a more positive channel. It would then be difficult to classify Us and Them as a classical tragi-romance because, unlike the male protagonists in many Chinese tragi-romances, our protagonist actually succeeds in building his own business and eventually joins a larger game studio as a senior business leader — senior enough to fly business class. Jiangqing attains such material success that he is able to purchase a home in Beijing for his family — attaining the dream of his ex-lover. That said, Us and Them spares no time before it jumps back to a stark reminder that, despite all the material success Jianqing might have in the world, he may still not be happy. This explains then, the sang culture that has taken root in China: what’s the point of participating in the rat race if you’re just going to be miserable when you cross the finish line? Even if you become the millionaire CEO of a tech startup, are you going to ever truly be happy? We can easily evoke the Americanism of “it’s lonely at the top” here. As Jianqing and Xiaoxiao talk in the present day, Xiaoxiao mentions that she started to learn English — and says “I miss you.” However, she quickly corrects herself and says she meant “I missed you” — just as Jianqing replies “I miss you too.” This awkward exchange shows that ultimately Jianqing isn’t sure whether he truly wants this materially successful life, or just wanted to be with the sweetheart of his younger days. However, Xiaoxiao recognizes that the past is in the past, and no amount of regret can change the decisions that she and Jianqing made to get to where they are today. Us and Them will bring you on a roller-coaster of emotions; and ultimately it might encourage you to drunkenly look up your ex on Facebook and send them a message (which ironically the protagonists of this film would never be able to do, given Facebook is blocked in China). After all, you never know — maybe you’ll find yourselves reminiscing together about the cheerful days of your youth. Us and Them (Chinese: 后来的我们)—China. Directed by Rene Liu. First released April 2018. Running time 1hr 50min. Starring Zhou Dongyu and Jing Boran.